Becalmed after sunset, we towed some fellow sailors back in. 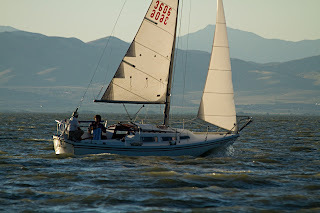 The winds have been great over the past several days so I was anxious to finally get out sailing last night. There was a little breeze though - a fairly steady 5 knot breeze that blew out of the southeast for three hours, so it wasn't all bad. I had two friends accompany me for the guys night out sailing tonight. Both spent a few miles at the helm and we made 3 1/2 to 4 knots for much of the evening. I need to add a spinnaker to the Unsinkable 2. Instead, I flew the big 150 genoa that had just enough air to shape nicely and give us some great lift across the lake. 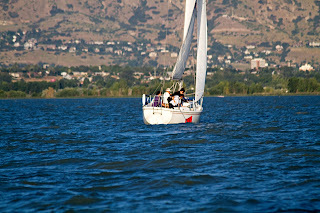 With such a light wind, Utah Lake stayed fairly flat all evening. Cruising across the silent sea, the only sounds we could make out were the outboard prop dragging in the water, interrupted distantly by an occasional distant powerboat. 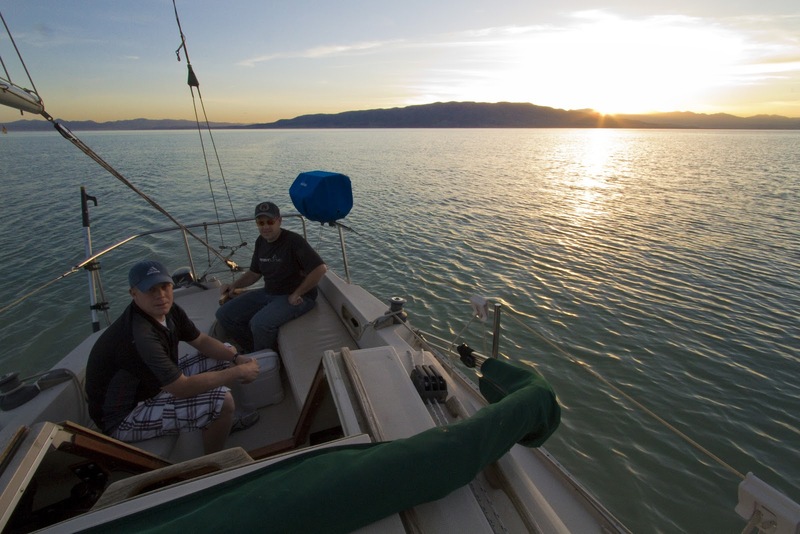 Utah Lake is a beautiful, peaceful place to sail. 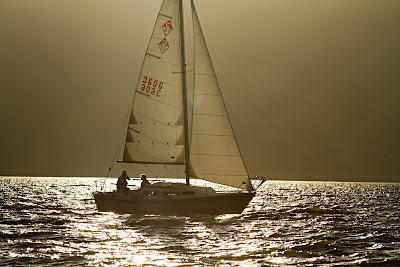 We talked about switching to silent running by lifting the outboard out of the water, but as the only experienced sailor on board I knew that if I fell off it might take a few minutes before the boat made it back to pick me up. And the best sail for speeding that process up is the iron genny. So, down she stayed. There is usually a breeze that picks up right after the sun goes down, but tonight when the lights went out the lake went completely still. After listing around for 15 minutes, we finally gave up and started motoring back to the marina. 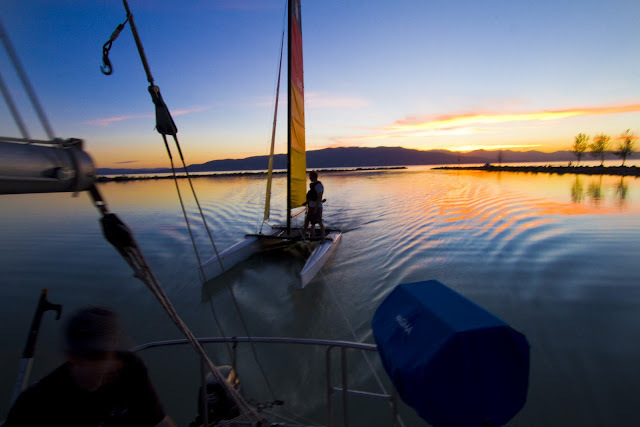 Just outside the entrance, we came across a hobie cat, crewed by two sailors-turned-paddlers. We threw them a line and towed them the last few hundred yards to the docks, as seen in the first picture in this post. Winds were forecasted to run 9 knots most of the afternoon so my son Zack and I headed down to the marina for some sailing. 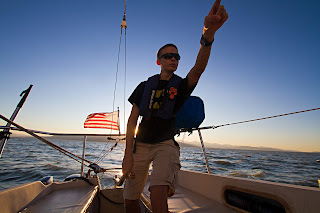 At the docks we ran into Todd Frye of the Bonneville Sailing School. He is planning a group charter to the San Juan Islands in October that I'd like ke to attend if possible. I've been thinking about moving up to a larger boat lately, so we imposed on Todd for a tour of his Catalina 27. 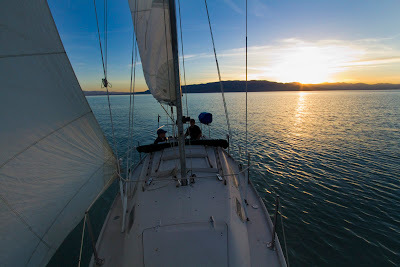 I have sailed a Catalina 270, which has the perfect layout for the day sailing/occasional overnighting I do, but they are out of my budget so I thought I should look into one of the older 27s. I was really impressed with what I saw. Although I'd like to go bigger, the 27 is as big a boat as can realistically be sailed on Utah Lake given the current constraints of trailer launching and slip sizes. 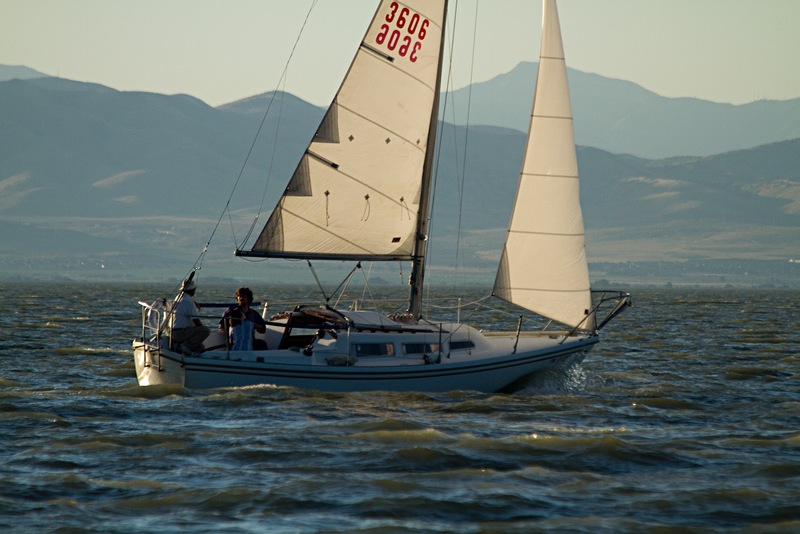 And the prices of the 27s are really hard to beat, they are usually a little lower than a same-year Catalina 25. It took us about ten minutes to hose off the boat, due to a large accumulation of bugs the last few weeks. The scupper vents were covered with dearly-departed mayflies, and a few entrepreneurial spiders had built an aft sail from spiderwebs. The dock hose and deck brush restored bristol order to things without much effort. Zack did all the sailing tonight. He wants to be able to captain the boat on his own, and he's well on his way. We sailed several miles west, crossing between several other sailboats on the way. We thoroughly enjoyed the steady 8-9 knot winds. 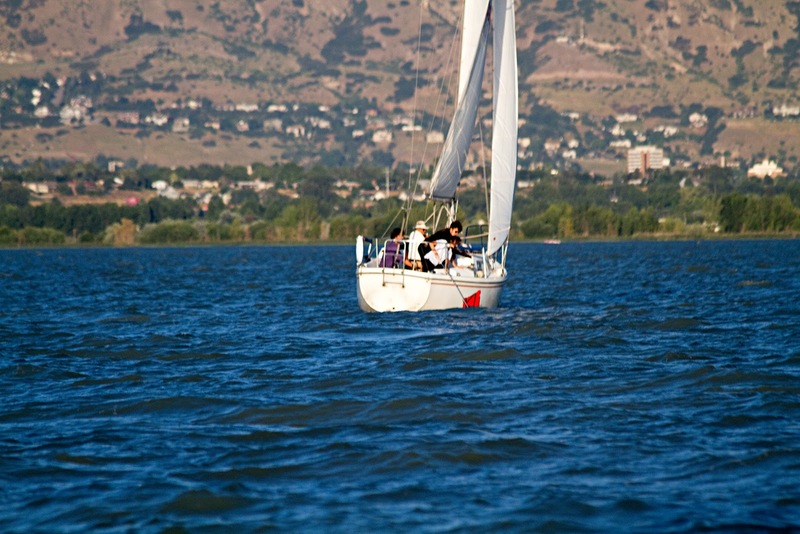 Utah Lake can be whipped into 5 or 6 foot waves when winds reach the mid teens. Although exciting, all the rolling is tiring in a 6,000 lbs boat. But 8-9 knots is just right. Eventually we tacked back on a northeasterly heading and watched as Todd took his students through a man overboard drill. There are few things more stressful or more frustrating than a sailor's first man overboard drill. 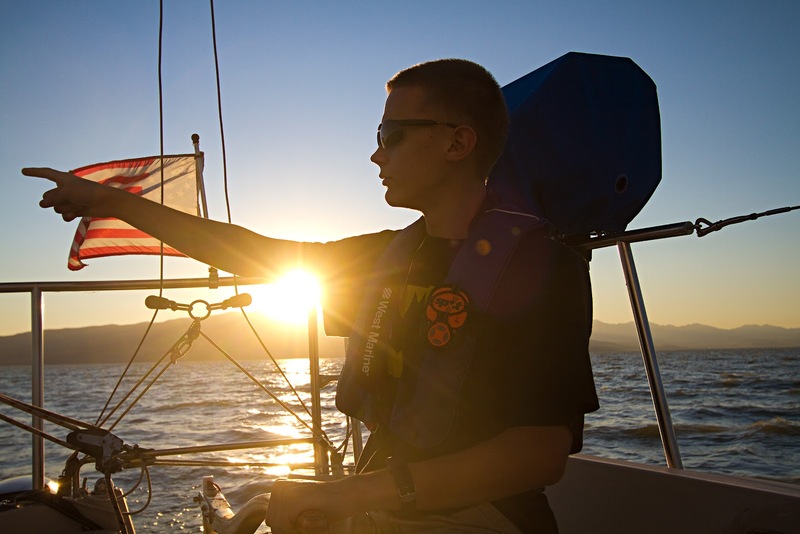 It comes at that time in his nautical pedagogy when he is beginning to feel that he "has this sailing thing figured out. " But after several misses (followed by several not so near misses) he realizes he doesn't know any where near as much as he thought. Although the still-floating empty life jacket eludes him, the newfound humility does not. 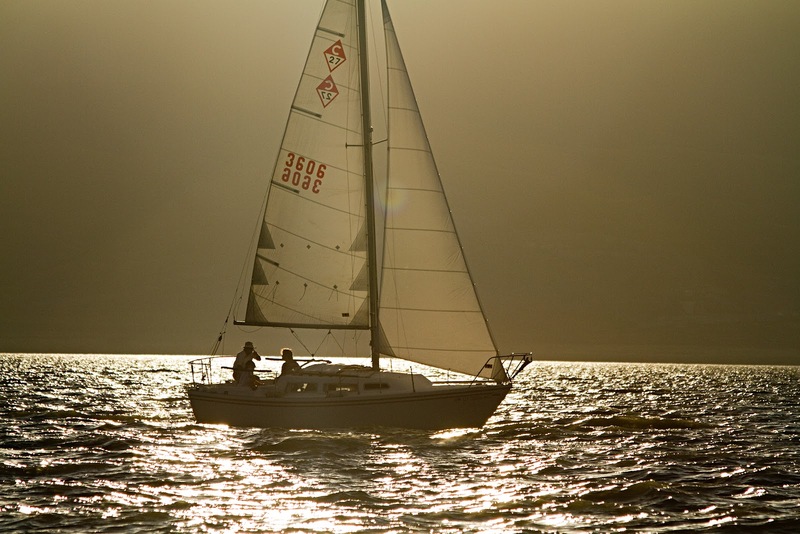 Sailing is quick to teach the humility lesson as soon as the sailor forgets his place. The cycle of pride and humility is the familiar rubric of old salts everywhere. No need to write it down, when you forget your place, the sea will remind you.